I’ve been reading the work of Alfie Kohn recently. 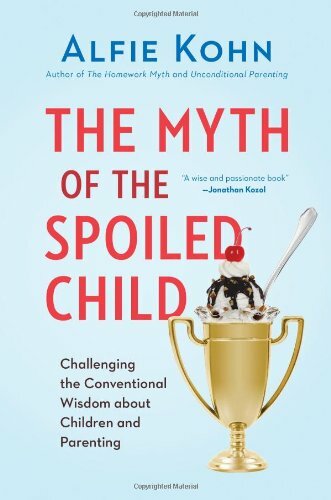 In particular ‘The Myth of the Spoiled Child’. I applaud his ideas, especially those about education where he, like me, finds the obsession with competition, grading, testing and trophies for winning rather distasteful. It illustrates something many people misunderstand; the difference between personal excellence for personal excellence’s sake, instead of for the sake of winning. I’ve always abhorred the idea of competition in an educational climate. Competition is not about personal excellence or individual growth which education should be, it is about beating others. And in today’s school climate very much about league tables and the big commercial and political business education has become. Some people are fine with that; it’s a competitive world, I hear people cry, and kids have to be taught how to cope. But Kohn has his own strong arguments against that position and why it’s of benefit to no one. Namely that driving our kids to learn and excel because ‘it’s a competitive world’ doesn’t have as much impact on their achievement or do a lot for their mental health as encouraging them to excellence because it is fulfilling. And also avoids making others feel bad – unlike competitive practices. And isn’t that part of the idea of education? To learn how to live together and contribute with compassion? He goes on in his book to talk about ways of parenting that revolve around ‘working-with’ the children rather than ‘doing-to’. That can also be applied to the way we educate and is probably the position that most home educators adopt within their approach! And I love his idea, as the book draws to a close, of encouraging ‘reflective rebelliousness’ where young people are encouraged to question rather than practice mindless obedience, and we should as parents support their autonomy in a way that complements concerns for others. Certainly sounds a bit like home educators to me! It’s well worth a read! ← Could I really afford to homeschool? When dd was at nursery and I told them she was going to be home educated one of the reasons the manager gave for this being a bad idea (as if I’d asked for her opinion) was that she judged dd to be competitive and school would encourage that. I don’t think it crossed her mind for a second that I would view that as an unfortunate character flaw, something NOT to enourage and therefore a very good reason NOT to send her to school. There I was thinking I was the only one who thought this. I also wonder if there is an element of pure parent projected competitveness when it comes to the 11+ or tutoring from an early age, rather than what would be best for that child holistically. I am starting to conclude, having just read Sir Ken Robinsons new book, and the conversation I hear, that actually many parents probably give very little thought about what is they are trying to achieve with their child, including when entering them into a competition. I completely agree with you Marcelo; much of the competitiveness comes from the parents but it’s often because they’ve been misguidedly conditioned to think it’s part of what education is! And few question what the overall objective of education is. Many thanks for posting.